Have I ever mentioned that I keep my husband around in spite of some near fatal flaws? Well, if I haven’t… I do. I’m a sweetheart that way. I mean, this is a man who claims to not like doesn’t like sweets and is married to a blogger who makes mainly sweets. he also doesn’t like wings, which I adore, won’t eat mushrooms… which I adore… hates Bleu Cheese…which I adore…prefers white wine whereas I prefer red… and so on. You seeing a pattern here? That said, his not liking the type of dessert I most frequently reach for does have its benefits. I get to eat what would have been his. This is why I keep him. This flan is so perfectly seasonal. 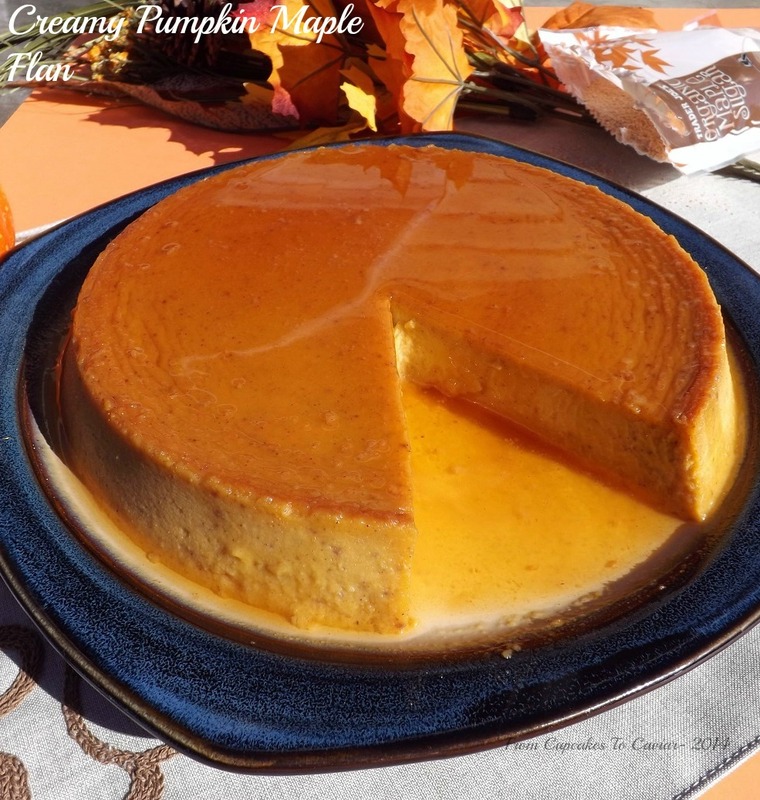 Pumpkin and spices combine with a subtle hint of maple and all of that is based in a creamy, silky smooth flan. Add in the sweet caramel topping and it’s Heavenly. Preheat the oven to 300 degrees. Start a kettle of water to boiling. Combine the regular sugar and the water in a small pot. Cook over medium heat, stirring until the sugar is dissolved. When the sugar is dissolved, turn the heat up to a medium high and cook, with NO stirring, until the caramel is a medium brown color, about 10 minutes. Do NOT walk away from this to tend to the kids, vacuum, take a nap, whatever. Stay near it and just work on the rest of the recipe and check it frequently. When it is ready, pour it onto the bottom of a deep 10 inch round pan that you have placed inside a larger pan. I use a cake pan. For the flan part, in a large bowl, combine the cream cheese and maple sugar. Beat well at low speed with a hand mixer. Add in the pumpkin and spices and beat at low speed. Add in the eggs and the yolks and beat until combined. Add in the cream and sweetened condensed milk and whisk (trust me… don’t continue to use the beater. Don’t ask how I know these things.) until it is thoroughly combined. Use a fine mesh strainer and strain this through it into the pan with the caramel. The straining isn’t absolutely necessary but it prevents you from having any fibrous parts in the custard and makes it much smoother. Carefully place the whole pan into the 300 degree oven. Carefully (again), pour the boiling water into the large pan surrounding the flan, being careful not to splash it into the flan itself. You want it to come about halfway up the side of the cake pan. Bake for about 60 to 70 minutes or until a butter knife inserted off center comes out clean. The center should still be jiggly, but not loose; rather like when you wiggle set jello. Cool for about 60 minutes, then put in the fridge to chill for at least 2 hours or so. Place a large plate over the flan and invert it onto the plate. This entry was posted in caramel, Desserts, Holiday Foods, Maple, Pumpkin, Thanksgiving and tagged creamy, dessert, maple, pumpkin, Thanksgiving by Janet. Bookmark the permalink.